The Elkhart Education Foundation welcomes the return of Adriana Trigiani to the Michiana area! 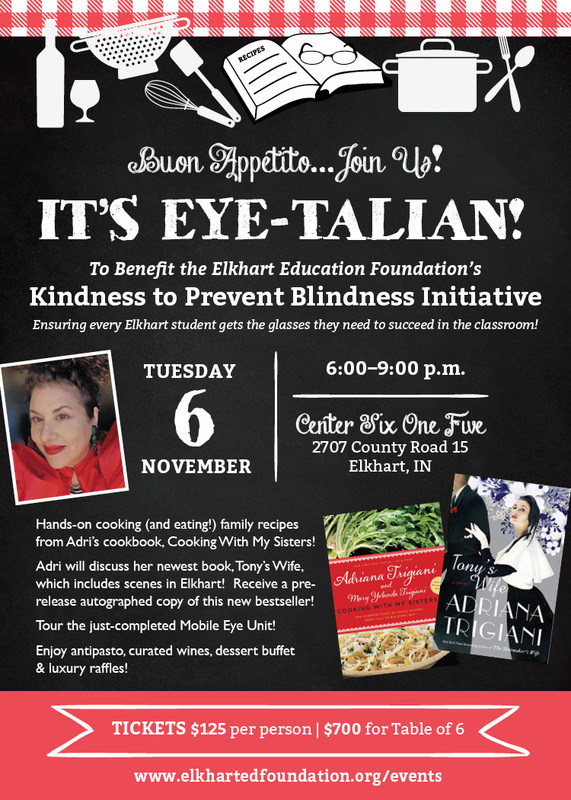 This event, It's Eye-Talian, will feature Adri as head chef while guests prepare (and eat!) a meal from Adri's cookbook, Cooking With My Sisters. Tickets include your meal, wine and antipasto for each table, a dessert buffet, and an advanced, autographed copy of Adri's newest novel, Tony's Wife. The evening will also include a tour of the mobile eye unit, luxury raffle items, an opportunity to purchase any of Adri's 18 books, many fun giveaways, and much, much more! This Initiative ensures success in education with accurate eyesight! In collaboration with Boling Vision Center and the Lion's Club, our mobile vision unit offers check-ups and corrective eyewear for students who need glasses! Starting in 2018, the mobile vision unit will visit Elkhart Community Schools to benefit over 4,000 students. The Initiative will expand into other school districts thereafter, incurring ongoing operation and travel costs. Consider donating toward these ongoing expenses, such as upgrading the equipment and the cost of fuel. Kindness To Prevent Blindness is a program of the Elkhart Education Foundation, a 501(3)(c) non profit organization.